Protect your Sony Xperia XA from bumps and scrapes with this black ArmourDillo case from Olixar. 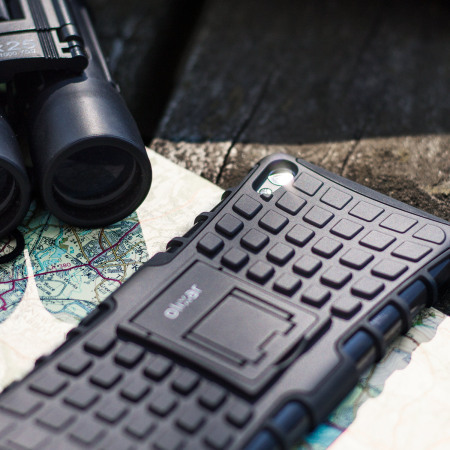 Comprised of an inner TPU case and an outer impact-resistant exoskeleton, with a built-in viewing stand. I love this case. I dropped my phone constantly before having this case so was looking for something robust but that wasn't too bulky. This has ridges that gave me extra grip, so I hardly ever drop now and when I do, it's nicely protected. It's also quite cool looking and not heavy or too big. The flip stand is a bonus too. got it the other day fast delivery looks good on my phone. Has protected my phone from a couple of falls onto a hard floor already. I bought this for my husband and he is extremely happy with the case. It fits the phone perfectly, including space for any buttons, jacks etc. He loves the extra grip it gives him and the extra bonus of having a stand. It seems to offer good protection for your phone. We're very happy that we purchased this phone case. This is great. Fits perfectly with all controls being easily accessible. This phone is slim and hard to hole but the casing provides a great grip and protection in case you drop it. Really good fit, strong and flexible. Its really good looking and the stand makes usage easy and convenient. Delivery was fast and communication good. Better than I expected. Great value for money! I am delighted with this phone cover, it says firm in the hand, no wasted time in opening up. The surround protects the screen when laid down flat. I have kept the plastic screen guard that my phone came with and will just replace that when necessary. The buttons still work and all the screen is visible. I bought a new phone, and now being clumsy beyond belief I wanted to protect it from the blows, drops and scratches that are my life. When I saw the Oxilar ArmourDillo Protective case I thought it looked as though it would meet my needs. I bought it hoping I had made the right decision and then, when I received and fitted it I realised I had made not just a good but an exceptional choice. Solid but resilient and robust and with a great stand to help with inputs it's all I could want. Brilliant. If all my purchases could be up to this standard I would be extremely pleased. Good product worth every penny, should stop me wrecking the phone. This cover is very easy to put on your phone, it's got excellent grip I do suffer with arthritis & dexterity problems and Ive found this cover helps make life much easier. All the covers buttons fit perfectly just like a glove. I would highly recommend this product to everyone especially those with hand & grip problems. Olixar ArmourDillo Sony Xperia XA protective case. The product ordered arrived in good time and as advertised. It was fit for purpose and I'm happy with it and the service. The Olixar ArmourDillo Sony Xperia XA Protective Case arrived in good time and as advertised. It should help keep my phone undamaged. Best ever mobile cover i have seen tough, reliable, efficient, looks with every thing. Superb & tough mobile cover. This is the best mobile cover I ever had it would really long last. The Olixar brand cover purchased for my Sony Xperia smart phone is an excellent quality accessory totally fit for its intended purpose. I ordered the case and the delivery was quick and a quality product. The cover is exactly what I needed., and arrived within two weeks. Very nice case that fits the phone perfectly even with a protective glass screen protector fitted. It completely encases the rear and sides of the phone and after bying two or three cases elsewhere this one finally fitted and allowed me to use all the phones buttons and features. The delivery time was amazing (less than 24 hours) and gave me up to date parcel tracking too. I will be using Mobile fun again and would recommend them to others. Sturdy and dependable product. I am happy with my choice. The buttons work really well. Everything fits perfectly. A little worried about the integrity of the stand, but not a major issue. Dropped the phone three days after receiving the case and the case did it's job. Had it a little while, I have had it drop, it's very solid & reliable, looks great, and fits the phone perfectly. This was my second one of these cases I bought as the first one was so good. This case fits absolutely perfectly. It snugly locks itself around the phones exterior to protect it without turning it into a brick. The contours on the edges vastly improved the grip of the device while the raised edge around the screen should prevent an impact reaching the glass. This case does not impede any of the ports, buttons or cause shadows on the camera. It comes with an integrated stand to allow the device to be stood in landscape for video watching. Overall I couldn't be happier with this case. It protects the phone without turning it into a massive block. I. 've dropped it from a shirt pocket and then stepped on it all without any issue for the phone. Highly recommended.